France is the second-largest country in Europe (after Russia). Much of the country is surrounded by mountains. The highest mountain, Mount Blanc, is near France's border with Italy. 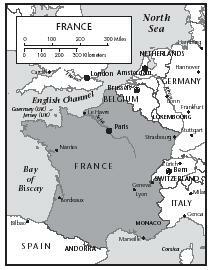 The climate and soil of France create good conditions for farming. Although only four percent of the French people earn their living from farming, the country is self-sufficient when it comes to growing its own food. The French have always been proud of their sophisticated way of cooking. Fertile soil provides fresh fruits, vegetables, herbs, grains, and meat, nearly year-round. The soil is also suitable for growing grapes, which are used for making some of the finest wines in the world. Food and alcohol play important roles in French society—the way a person eats often reflects their French heritage, region of birth, social status, and health. During the reign of Louis XIV (1661–1715), the nobility (upper class citizens) would hold twelve-hour feasts with over ten different dishes served. The presentation of the food was just as important as the taste and quality of the ingredients. Such elaborate feasts were too expensive and required too much time for the common people to prepare for themselves, but others were also able to enjoy exotic foods and spices, such as the kumquat fruit and yellow saffron, brought back from Africa and Asia by explorers. These foods were quickly incorporated into the French diet. sandwiches. Melted cheese spread on a baguette is often presented as part of a meal. A meal of grilled food (called la raclette ) is sometimes served. Using an open grill, diners melt their own cheese with ham or beef slices, or fry their own egg. The grilled food is accompanied by potatoes. Sometimes diners spear pieces of bread on long-handled forks, and dip the bread into a pot full of melted cheese called la fondue . The regions of France have varying cuisine: in Brittany (northwestern France), the main dish is crêpes (thin pancakes) with cider; and in the Alsace region (eastern France near Germany), a popular dish is cabbage with pieces of sausage, called la choucroute . The French from the Loire River Valley eat a special dish made of the Lotte fish that can only be found in the Loire River. On the coasts of France seafood is plentiful, including mussels, clams, oysters, shrimp, and squid. The French enjoy escargots (snails) cooked with garlic and butter, roast duck, and rabbit. Dissolve the yeast, salt, and sugar in water in a large mixing bowl. Stir in the flour until a stiff dough forms. Turn the dough onto a floured surface (countertop or cutting board) and knead for 10 minutes. Clean out the mixing bowl, lightly oil it, and return the dough to the bowl. Cover the bowl with plastic wrap. Let the dough rise until doubled in size, ½ hour or so. Dip your fist in flour and push your fist into the center of the dough to "punch" it down. Remove from the bowl, and knead 3 or 4 more times. Separate the dough into 4 equal pieces. Form each piece into a long loaf. Place 2 on each of the greased cookie sheets. Carefully slash the top diagonally every few inches with a knife. Brush the loaves with the egg white. Cover lightly with plastic wrap and let the loaves rise again for about 30 minutes. Preheat oven to 400°F. Bake loaves for 10 minutes. Lower heat to 350°F and bake 20 more minutes. Slice the baguette in half lengthwise. Spread one half with mayonnaise or mustard, depending on preference. Arrange sliced cheese and ham over the mayonnaise. Slice the sweet pickles in half, and arrange on ham. Top with sliced tomato and lettuce. Wrap in plastic wrap and carry for lunch away from home. 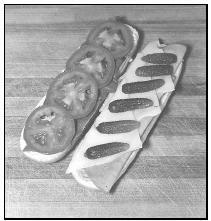 A uniquely French accent to the filling of the Baguette Sandwich are the cornichons (French pickles). Melt the butter and olive oil in large saucepan over medium heat and add the onions. Brown the onions for about 5 minutes. Sprinkle the flour on onions and stir until dissolved, heating 5 more minutes. Add the wine (if desired) and the water. Add the bouillon cube and dash of Worcestershire sauce (if desired). Pour soup into bowls. Float a slice of bread in each bowl. Top the hot soup with cheese. Place a slice of ham and a slice of cheese between two pieces of bread; repeat this step on the same sandwich to make a triple-decker sandwich. Repeat to make 4 sandwiches in all. Arrange the sandwiches in a baking dish. Make the béchamel: Combine the flour, milk, butter, salt, and pepper in a saucepan. Heat over low heat, stirring constantly with a wire whisk, until the flour has completely dissolved. Pour the béchamel (white sauce) mixture over the sandwiches and top with the grated Swiss cheese. Bake for 15 minutes, or until the cheese is melted and crusty. Serve on 4 plates. 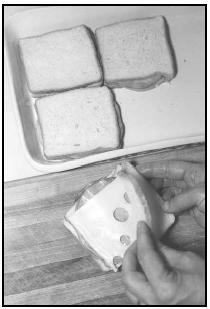 Cut sandwiches into halves or quarters. These triple-decker croque-monsieurs (ham and cheese sandwiches) will be covered with a creamy sauce and topped with shredded Swiss cheese before baking. Packaged instant chocolate mousse mix, simpler to prepare than this traditional recipe, is available at most grocery stores and may be substituted. Major French holidays include Christmas (December 25), New Year's Day (January 1), and Bastille Day (July 14). On Bastille Day, named for the prison that citizens stormed on July 14, 1789, the French celebrate their liberation (freedom) from the monarchy and the beginning of their Republic. There are fireworks, dances, and parties with picnics. Picnics almost always include fromage (cheese), such as Camembert, brie, chevre (goat's milk cheese), or Roquefort. Arrange the cheeses on the wooden cutting board. Line the basket with a napkin ( serviette in French), and fill it with crackers or the bread, sliced into thin rounds. Diners will use the knife to cut their own individual slices of cheese. Serve at room temperature. For Christmas, the French have large feasts with many courses, which usually end with a Bûche de Noël, or Yule log. This cake is shaped to look like a log of wood because of the traditional French custom of lighting a real log at Christmas. On the first Sunday of January, the Christian holiday, Epiphany, is celebrated, marking the three kings' visit to the newborn baby Jesus. For this occasion, a special dessert called la galette des rois, is prepared. A small token, either a bean or porcelain toy, is baked inside. Whoever finds the hidden bean or porcelain toy in their piece gets to be king or queen for the day and wear a golden crown. Traditionally, the king (the man who found the bean in his piece of cake) had to pick a queen and present her with a gift. To avoid this obligation, the "king" would sometimes eat the evidence. To solve this problem, in 1874 French bakers began putting collectible porcelain charms in their cakes instead of beans. Grease a jelly-roll pan (cookie sheet with a rim all around) and line the bottom with waxed paper. Grease the waxed paper well. Beat the eggs until frothy and pale yellow in a large mixing bowl. Add the sugar and water to the eggs and continue to beat. Mix flour, cornstarch, baking powder, and salt in a separate bowl. Add the flour mixture to egg mixture. Remove from oven. Cover pan with a clean dishtowel, and turn over to remove cake from pan. Remove pan and carefully peel off the wax paper. (Cake is wrong-side up.) Trim off any crusty edges. Fold one end of towel over short end of cake, and carefully roll cake up inside the towel. Lift the whole roll and place it, seam side down on a cooling rack. Allow to cool completely. Unroll carefully. Coat the cake completely with jelly. Carefully roll the cake back up again, without the towel. Cut a 2-inch slice from one end and cut in half. Attach these pieces to the sides of the cake to resemble branch stubs on a log. Frost the cake "log" with chocolate icing. Drag a fork along the length of the cake, scoring the frosting to resemble bark. Arrange holly berries and evergreen leaves around the cake if desired. When entertaining at home, the hosts pride themselves on making mealtime a memorable and positive experience. For everyday lunches and dinners, four courses are typically served: salad, main dish with meat, cheese with bread, and dessert. Bread and water are always served. Special occasions include even more courses such as an appetizer of savory pastries, or other finger foods. This is normally served with an alcoholic beverage, often French wine. Several bottles of wine may be served with the meal. Coffee is also served. Restaurants in France are generally more formal than those in the United States. It is expected that patrons are there to have a full meal. Wine is ordered by the half or full carafe (a glass container). Waiters are rarely tipped because a fee for service is added to the bill for the meal. Eating out is a social occasion, and is a leisurely activity. It is considered rude to ask to have leftover food wrapped to be taken home. Several fast food restaurants such as Quick (a French version of McDonald's), and Pizza Hut are available. Sidewalk vendors and cafés or local boulangeries (bakeries) also offer quick. The typical eating habits of the French include three meals a day, with tea served at 4 p.m. Breakfast often includes a fresh baguette and buttery croissants, sometimes filled with chocolate or almond paste. Coffee, café, is usually very strong; café au lait is coffee served with hot milk. Fresh fruit and yogurt are also common at breakfast. Lunch is the main meal of the day and takes more time to eat than the typical lunch in the United States. For this reason, many businesses are closed between 12 noon and 2 p.m. A school lunch might consist of a baguette filled with cheese, butter, meat, lettuce, and tomato. Dinner usually takes place after eight at night. The diet of the French people is generally considered healthy, and most citizens receive adequate nutrition. 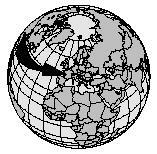 In 2001 the countries of Europe experienced outbreaks of two diseases, "mad cow disease" and "hoof and mouth disease" that affected the cattle and sheep herds. Many countries enacted laws and regulations restricting the import and export of meat during that period, until the diseases could be brought under control. In France, there have been protests at some fast food restaurants in an attempt to drive them out of the country to keep the traditional quality of French food and the French lifestyle. Denny, Roz. A Taste of France. New York: Thompson Learning, 1994. Fisher, Teresa. France. Austin: Raintree Steck-Vaughn, 1999. Langer, William L. An Encyclopedia of World History . 5 th ed. Boston: Houghton Mifflin, 1980. Loewen, Nancey. Food in France. Vero Beach: Rourke Publications, 1991. French Food and Cook. [Online] Available http://www.ffcook.com (accessed July 24, 2001). French Information Center. [Online] Available http://www.france.com (accessed July 24, 2001). Recipe Source. [Online] Available http://www.recipesource.com/ethnic/europe/french/ (accessed July 24, 2001). Babette's Feast. Rated G. (1987) This film is set in France in the late 1800s. During an uprising, a French chef named Babette is exiled to Denmark where she becomes maid and cook for two sisters. Babette spends years making simple meals for the sisters until one day she wins the French lottery. Babette uses her winnings to prepare an extravagant seven-course French meal for the sisters and ten other community members. The film depicts the lavish feast in detail, including the food preparation and consumption. i think these recipies are very nice to be able to find and that the help out alot! thank you so much! wow. this article really helped me with my food and nutrition project. This information is very useful. Thanx to the person who posted here. Thanx alot. Good Job! This has really helped me figure out how my french theme dinner party should flow. Thank you!